John Coker is passionate about rocketry, so it stands to reason that he would put a great deal of work into any launch. 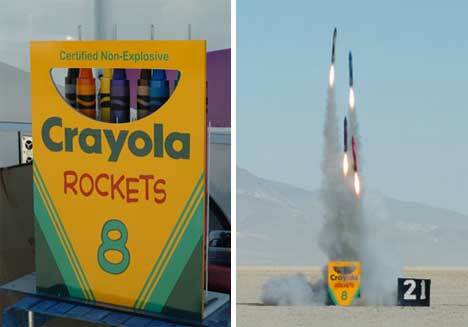 But when he built a pack of eight crayon-themed rockets and planned to launch them all at once, he topped even himself. The project began in 1998, but had to be put on hold for a while. The rockets were eventually completed, and then launched, in 2004. The rockets were built from scratch with Loc/Precision components. 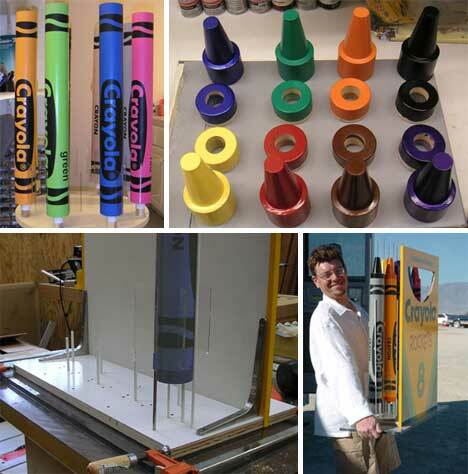 The noses and tail pieces (the two ends of the crayon) were custom-made from balsa wood and hardwood to achieve the ideal weight distribution. 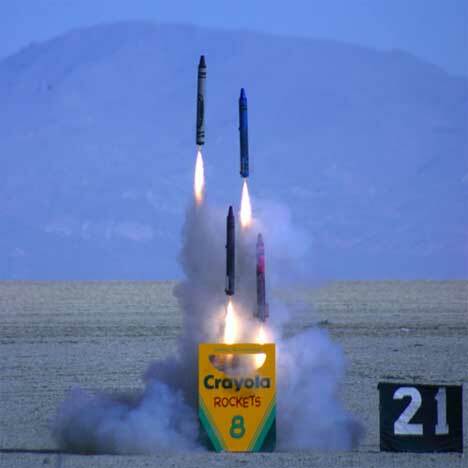 Vinyl decals were applied to the rockets’ bodies to represent the paper crayon wrappers. After the painstaking painting and assembly phases, the rockets were placed into their “box” (which was actually a vinyl sign, behind which the rockets were launched) and taken out to meet their destiny. Unfortunately, only four of the eight rockets launched successfully, but the four that made it into the air looked absolutely awesome. This is how DIY tech projects should be done: passionately, wholeheartedly, and with a great sense of humor. See more in Do It Yourself or under Technology. February, 2010.